We’ve smoked out five promising new barbecue spots. Meat Cred Pit Master Grant Carter was an avid at-home ’cue guy while cooking professionally in Chicago and Los Angeles. The Smoke A custom-built smoker from Missouri standard bearer Ole Hickory spends quality time with brisket, baby back ribs, and chicken. The Sauce Four house sauces range from a sweeter, classic style, to a spicy chipotle, to hot vinegar and Carolina mustard versions, all in tabletop squirt bottles so you can apply at will. Mac and Cheese? Top it with braised greens, sliced hot links, or one of seven other add-ons. Where to Sit If you’re toting kids, park it up front in the industrial-meets-rustic dining room. Adults, head to the green-tiled semisecret bar in back. Meat Cred Co-owner Gabe Gagliardi is a Tennessee native who has cooked professionally for seven years and was a contestant on Hell’s Kitchen. The Smoke Baby back ribs spend 24 hours in a housemade rub, but unlike the pulled pork, sausage, and brisket, they don’t go in the smoker. Instead Gagliardi roasts them in the oven, the way he learned growing up. The Sauce Eight housemade versions make for a condiment-based Southern swing. Local rarities include a thin and vinegary North Carolina–style sauce, and a chicken-friendly Alabama-style version made with mayonnaise. Mac and Cheese? Abso-freaking-lutely. It’s shaped into balls, then battered and fried. Where to Sit – Within viewing distance of the television when there’s a game on, preferably with a Shiner Bock in hand. Meat Cred Paul Raney and his brother Tom were recreational barbecue geeks until they decided to take to the streets with a food truck. The Smoke The top-selling pulled-pork sandwich meat spends 24 hours in a secret-recipe dry rub, then gets smoked between 12 and 14 hours. The Sauce Tomato based and mixed in with pulled pork or chicken. Mac and Cheese? Macaroni comes in salad form rather than submerged in cheese. Red cabbage slaw, made with vinegar and a little bit of mayonnaise, is another favorite. Where to Sit On the curb, preferably near the truck’s napkin supply. Meat Cred For Texans and avid cooks Darrell and Michelle Lowe, retirement meant moving to Seattle to open a barbecue truck. The Smoke The Lowes built a 900-pound custom smoker onto the back of the truck; meat spends at least four hours, and sometimes an entire night, in Darrell’s homemade rub. The Sauce The Lowes don’t mess with the Texas credo that good barbecue needs no sauce, because it’s already marinated and flavored to the bone—though the meat does come lightly sauced. Mac and Cheese? It’s made with five different cheeses, but has some stiff competition in the “big a$$ Texas spud,” an enormous baked potato topped with bacon, cheese, onions, and a scoop of smoked brisket. Where to Sit Not in the onboard bathroom; it’s for employees only. The Smoke The seven-foot-long Lang smoker keeps busy with pulled pork, St. Louis ribs, chicken, and brisket, all dry rubbed with Sisneros’s special chili-powder blend in what he calls a New Mexican style. The Sauce Hovers midway between vinegar and sweet. 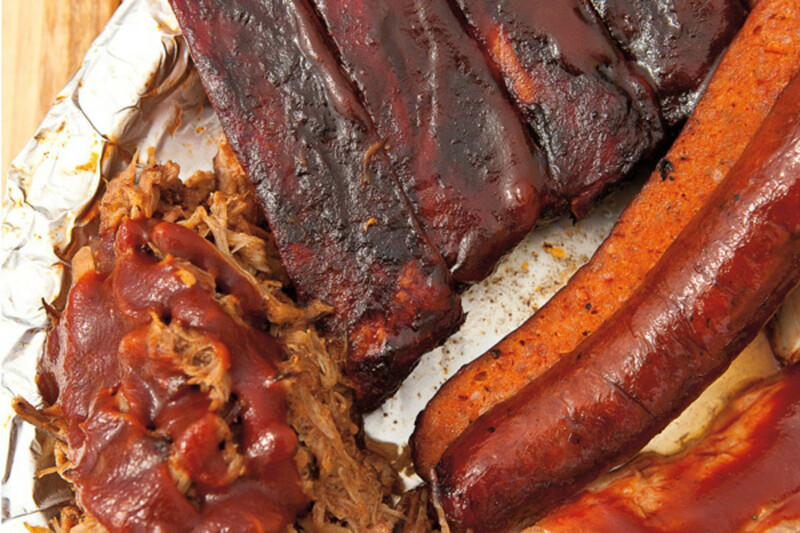 Barbecue purists will want to request it on the side. Mac and Cheese? Not here; instead Sisneros cooks up big pots of posole, another nod to New Mexico. Where to Sit In the sun. In February, Sweet Bones moved from the Othello Public Market to a permanent setup consisting of a tiny smoke shack and a killer patio, albeit one overlooking the parking lot of a 76 gas station.